YoYoExpert Blog & Yo-Yo News – General Yo HATRICK 10th Anniversary Edition! 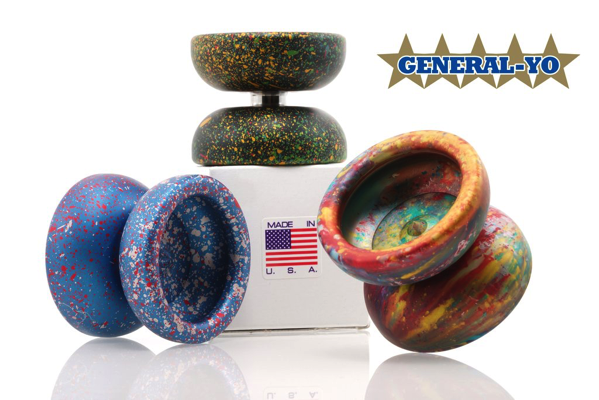 It’s been 10 years since the release of the legendary General Yo Hatrick and in honor of this special occasion they decided to release a limited run in some very cool colorways! The Hatrick is an undersized organic yo-yo with some serious power and impressive performance that holds up even after 10 years. The special 10th anniversary editions use the exact same design as the original, because when something is this good you don’t want to mess with it. It comes fitted with hat pads and a very grind friendly General Yo blast that Ernie does himself! It will probably be another ten years before General Yo releases the Hatrick again so grab one of these special anniversary edition Hatricks while you can! Releasing Friday 1/18 @ 8PM EST!